Disclosure: This site contains sponsored posts, affiliate links (which means I earn a percentage of the sale) and is part of the Amazon affiliate program, but all opinions are strictly my own. Where giveaways are just dandy! Disclosure: This could be a sponsored post or contain affiliate links (which means I earn a percentage of the sale), but all opinions are strictly my own. I love wooden toys. I love how they don’t fade or break, how they have a little bit of substance when you hold them in your hand and how they last forever! By forever, I’m talking generations.My grandma has a freestanding wooden elephant puzzle in her house. Itâ€™s white and I think it has four or so pieces. My cousins and I adored it growing up. It was always out in the house, and as I grew up the silly elephant stuck around. I think my grandma ended up having to repainting it (possibly a number of times) because the white started to look a bit dingy with so many little hands carrying it around, but it never broke and it never grew old. Twenty years later my grandma still has that puzzle! 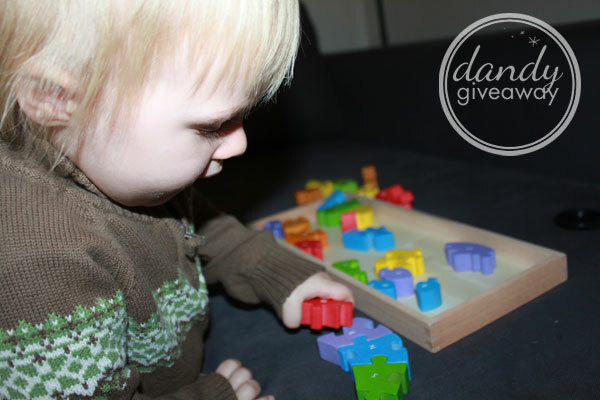 I think I first saw BeginAgain Toys as part of a promotion for wooden toys, since I already love the idea of wooden toys I was pretty enthralled with the whole list but I was absolutely mesmerized by the BeginAgain Puzzles. 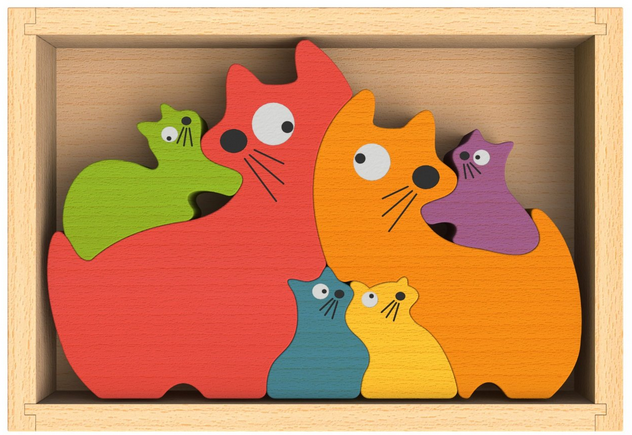 I was hit with a wave of nostalgia seeing the free standing animal family puzzles (they even have an elephant!) and pulled in by the beauty and simplicity of their designs. The patterns on their puzzles are unique, the painting is colorful, and theyâ€™ve made them even better learning tools by having lettered pieces (uppercase and lowercase depending on the side of the puzzle youâ€™re looking at). Kids are the true noisemakers! – No batteries, no electronics, ever! – Collaborate, share, and build in partnership. – Take OIL out of play, use plant based materials whenever possible and always reduce, recycle, and seek improvement. – BeginAgain gives 1% to the community. 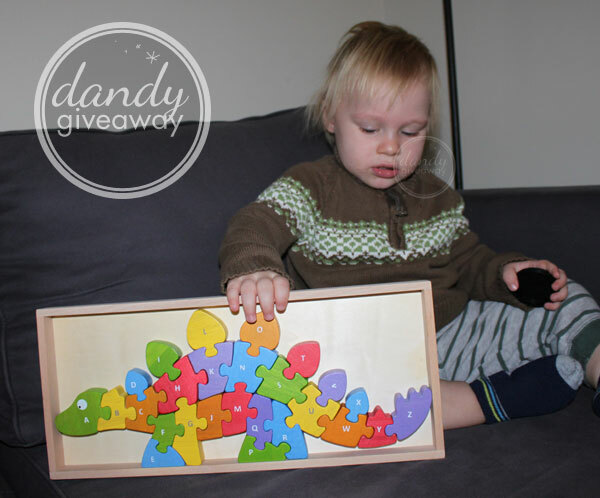 I couldnâ€™t wait to review the Wooden Dinosaur A-Z Puzzle! The puzzle came with a nice wooden tray, great for storing the pieces in when the puzzle if finished or still in pieces (though I wish the tray had a lid…). One side of the puzzle has capital letters the other side has lowercase letters so your child has a chance to learn both, and the puzzle can be built face up, face down or standing on it’s feet. The puzzle is well crafted and the pieces are solid and easy to put together. I was a little surprised by the difficulty of the puzzle, I thought it would be a breeze since itâ€™s more or less alphabetized, but I think I relied on the alphabet a little too much and it took me a try or two to piece the thing back together. I thought it was surprisingly fun to piece together and I really love how big the pieces are the 3D feel of the puzzle. Dimitri LOVED that this was a dinosaur! Butâ€¦, I think I might have been jumping the gun with his ability level. While he wasnâ€™t able to build the puzzle, but he did get a good chance to work on his fine motor skills as I helped him piece little bits of it together and he had a blast identifying the different letters on the pieces and sorting the colored shapes into piles. And the great thing about puzzle is, itâ€™s wood, itâ€™s not going to fade or break and we can play with it all over again when heâ€™s ready to start piecing the whole thing together. Your child might not be as into dinosaurs at mine, but no worries. 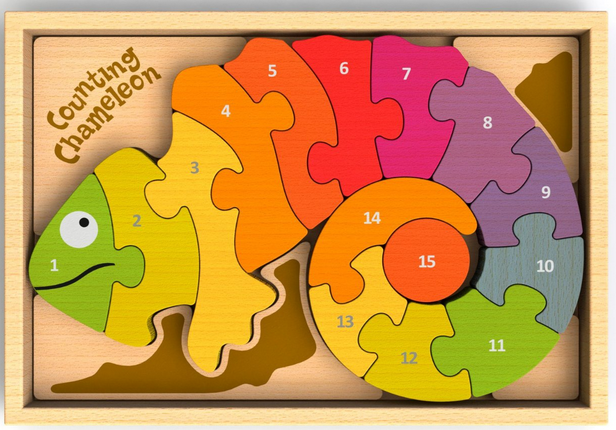 BeginAgain has a bunch of different puzzles with varying degrees of difficulty. 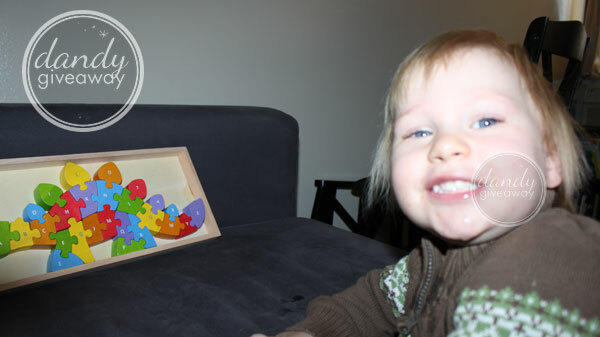 They have a butterfly that is suggested for 5+, a food assortment puzzle (Alphabites) that is suggest for 3+, and adorable wooden block puzzles for 18+ months. 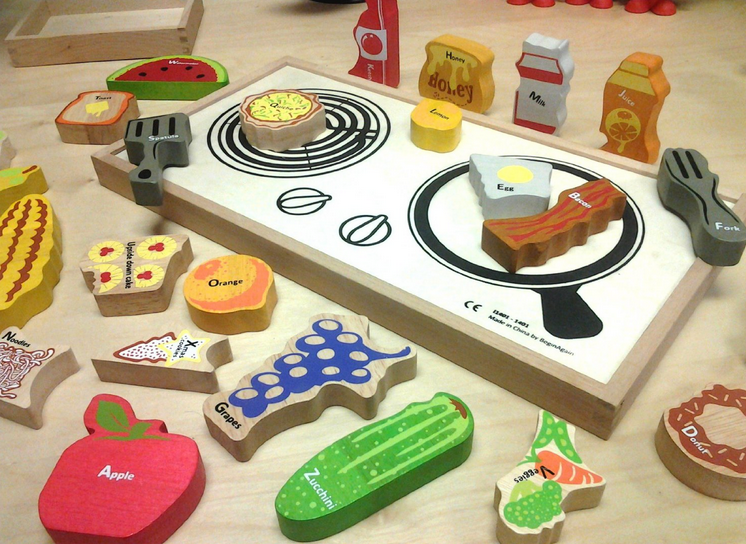 The Alphabites Puzzle, has pieces shaped like a bunch of food, and when all the pieces are removed from the tray, the tray is shaped like a serving tray, complete with plate and napkin and the flip side of the tray is shaved like a stove top! It sounds like some fantastic, dual use play food to me. 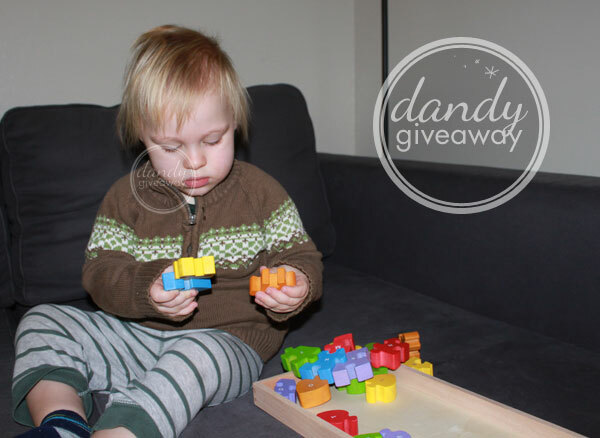 BeginAgain Toys has offered one lucky reader a Dinosaur A to Z Puzzle! This giveaway will run from Oct 3 – Oct 17, and will end at midnight EDT. It is open to US residents, ages 18+.Â Entries will be verified, winner will be notified via email and will have 48 hours to respond and claim prize or another winner will be chosen. For questions or concerns email DandyBritt@gmail.com – also consider adding that email address to your safe list, as winning email notification will be sent from it. Disclosure: Brittney from Dandy Giveaway received products from this sponsor to facilitate her review, no other compensation was received. Participating bloggers are not responsible for prize fulfillment. This giveaway is in no way associated with social media sites including Facebook, Twitter and Pinterest.